A gorgeous assortment of roses, chrysanthemums and lilies, all in white. 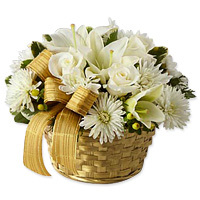 The flowers are arranged in a gold basket and adorned with a matching golden ribbon. Substitution of flowers may occur in case of unavailability. Only $159.99 - Click here to buy now! 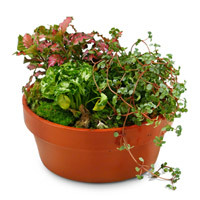 This cosmopolitan arrangement of assorted green plants, will add fluid harmony and luxury to your loved ones home or office. 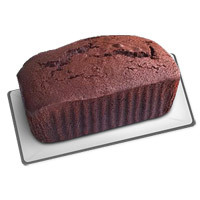 Only $119.99 - Click here to buy now! 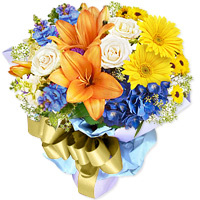 Forget plain red, from now on love comes in varied hue with this extravagant bouquet of orange lilies, yellow gerberas, white roses, yellow daisies, blue iris with seasonal flowers and fillers. Only $72.99 - Click here to buy now! 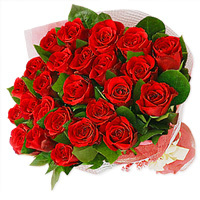 Surprise your loved one with these beautiful 25 Medium stemmed Red roses along with green fillers wrapped with lace,and cast a magic of love on them. Only $199.99 - Click here to buy now! 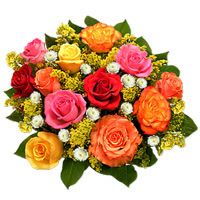 A lively composition of roses and chrysanthemums of varied hue, carefully arranged to depict a true masterpiece of nature. Only $167.99 - Click here to buy now! 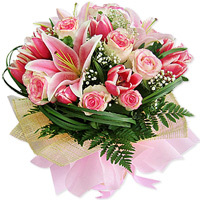 There is nothing like our exotic bouquet of fresh roses and lilies. So let their happy presence signify the blooming of new things. Only $114.99 - Click here to buy now! Only $79.99 - Click here to buy now!